Sehr schöner Kurzaufenthalt bei super netten Gastgebern. Die Lage des Ashville House ist optimal; Stadtzentrum und Nationalpark in unmittelbarer Nähe. Ausgezeichnetes Frühstück! It was great - rooms were spacious, clean and comfortable; breakfast was good quality with many choices and good service; staff were friendly and helpful; and, the location was very convenient. I recommend Ashville House. We were with 7 men and we stayed for 3 nights. We all can recommend this house. The rooms are clean, big enough and a good shower. The breakfast with its service is top! The house is very near to the center of this village, just a 3 minute walk. Perfect. Enjoyed our stay and would stay again if ever in Ireland. It was a really wonderful staying at the Ashville House near the center with good breakfast and very welcoming people. very nice place, friendly team, TOP! Everything ok. Thanks a lot!! We had a great four night stay at the Ashville House B&B. Declan and his wife were so accommodating to our needs. I have trouble navigating stairs and they made my life so much easier by putting us in a ground floor room. They were so knowledgeable about Killarney and the tours,sites and dining in the area. Our room was nicely decorated and daily service was provided. The breakfast room delightful and the food provided was plentiful and delicious. The location is wonderful to the city centre. We had a very lovely stay at Ashville House which is the perfect spot for getting to know Killarney and the National Park. It is spacious, clean and the service is excellent. The BnB is located outside the main street which makes it the perfect sanctuary for a quiet night but is really just a 5 minute walk off the center. I would recommend staying at Ashville House; we will definitely again. Excellent breakfast and very clean comfortable room, top notch! It was the best BB during our stay. We were 8 and we appreciated the comfort of rooms and excellent breakfasts ! Allready 3rd year in a row.Will make my reservation for next year as soon as possible. Excellent WIFI. Great location and reasonably priced for the area. Breakfast was great and the room was comfortable. 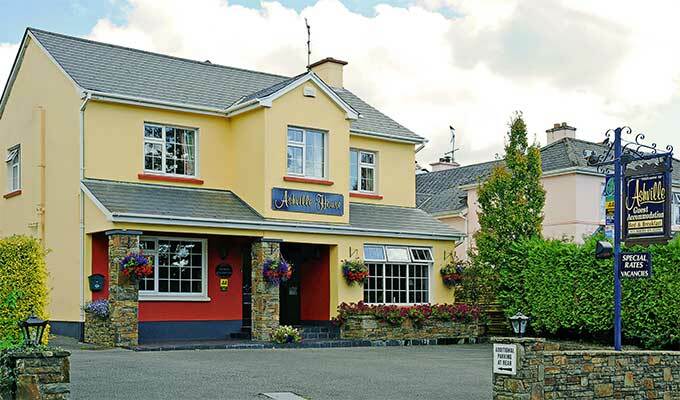 The accommodation at Ashville House in Killarney was terrific. The room was very clean, parking is available, the breakfast buffet included all basic necessities - fruit, yoghurt, juices, müsli, muffins, and bread. For warm breakfast dishes you could order with the staff - so this was always fresh. As we have never been in Killarney, we asked the staff for trails around the area. I received maps and I ended up planning the day with the staff, including possible routes to take, where to have a great view of the country side and places to eat. They were very helpful and absolutely nice to us! I can certainly recommend the Ashville house B&B and would definitely stay there again for my next trip to Killarney. We had a great stay and loved the breakfast! Good job at the Asheville house. Parking was tight but manageable . Centrally located only 5 min walk from main street in Killarney. May be more a hotel than a traditional B&B although the host does make an effort to provide good service including suggestions for activities during the stay. High quality rooms and very good breakfast cooked to order. Having just returned from our tenth visit, in the last eleven years, what else can we say Actions have always spoken louder than words. Just sorry your ratings only go up to Five Stars! Stayed here for 2 nights. It was spotlessly clean and had everything we needed. Great attention to detail. Best breakfasts we had during out 17 day stay in Ireland. The first morning I asked for cream for my coffee and they didnt have any but the next morning it arrived with my piping hot coffee. Excellent customer service. Only complaint is the size of the rooms and bathrooms. They were very tight but we were told they are gradually increasing the size of rooms. We were shown one of the completed renos and it was great. All in all a v good place. Excellent service, accommodation, location and breakfast. This was the second time we have stayed at Ashville House and would thoroughly recommend this BnB as a preferred place to stay in Killarney. Declan was the perfect host. Ashville House is simply a gem! The food is lovely,and there is always a warm welcome. The crème de la crème in Killarney! We enjoyed 2 nights in the Ashville House. Just 3 Minutes to the Center of Killarney. Breakfast was very good and the owner was very nice and helpful. Next time we come back again. Nice B&B. Private parking. Walking distance from town centre. Hôtes très sympathiques. Avons bien aimé et le recommandons sans hésitation. Everything was wonderful, great place to stay in Killarney. Everything is perfect about this B&B, location, spotlessly clean room & en-suite, nice front room for guests, good parking facilities, efficient staff. Breakfast was fantastic, very good menu, freshly made to order, great self-service selection, however, I would suggest giving guests the option of low-fat milk and vegetarian options for the cooked breakfast. Also, coffee drinkers love their own pot of coffee at breakfast time instead of the host coming & going to the table to refill the cup. I would like to see these small changes implemented as this B&B is always my first choice when I visit Killarney each year and these small changes make such a big difference to the guest. That is why I'm giving 4 out of 5 for the service. I found it expensive for a single room for 1 person. I cannot fault this B&B otherwise and highly recommend it as I have done to my friends & family and I will continue to go back there when I visit Killarney. Well-kept rooms and terrific location. Declan was very helpful at getting us into a restaurant on a busy Saturday night. Lovely premises with a warm and genuine welcome. Breakfast was a feast to behold. We will be back! Just returned home from our 9th stay since 2005. Declan, Elma and now son, Gavin, really do own the hidden gem of Killarney or maybe the whole of Ireland. Reluctant to say just how good the scrambled eggs are just in case we cannot get in there next year. My son and I stayed two nights at the Ashville House and it was perfect. Great location, helpful staff, comfortable room and delicious breakfast. Nice rooms, friendly service. Thank you! Great stay at the Ashville House. We arrived early but were given a room that had just been clean. The owner gave us great recommandation for pub and restaurants. The room was comfortable and clean. Walking distance from the National park and the city. Very good breakfest choice in the morning. I would definitely recommand to friends going to Killarney. Thanks for a great stay! I can't say enough good stuff about this hotel. Very clean. Declan was very hospitable, helpful and informative. I had booked and paid for a single room which actually turned out to be a spacious double room. Again very clean. Wonderful breakfast. I would definately go back there again and recommend it. Although the most expensive B&B we stayed in, the accommodation was hard to fault. On site parking allowed us to leave the car and walk the short distance to town. Breakfast was fantastic and the staff were very helpful. I would give 5 stars to this delightful Guesthouse. The staff were extremely friendly - the accommodation was great - very clean - with towels replaced every day and bedding every two days. The breakfast was superb and served by very friendly staff. Perfect location for town centre. Ireland is a beautiful country..
After pondering over many bed and breakfast places in Killarney we chose this one as even in the picture it looked like a lovely place to stay. It was the best B and B we have ever stayed in and we stayed in plenty over the years. Not one negative can I think of as the room was spotless and comfortable and the breakfast such a wonderful start to our touring days yes we booked also because of the porridge with Baileys, the best porridge we have ever had. Walking was easy to town to catch rail, bus and tours as well as enjoy our evening meals. Many thanks to the owners Declan and Elma and their staff who made our stay so enjoyable. Great place to stay. Excellent room, fine breakfast and service. Walking distance from city centre, restaurants and pubs. All very very good, lovely room, lovely breakfast, nice people. Everything you could want, excellent! We were only there for one night, but the accommodations were great. The location was ideal and the breakfast was very good. Parking was tight since it was a full house that night, but the inn keeper made it work out without any problem. Great value for the money. We had a great stay. Service and room were great. I would recommend it to anyone. very clean, nice place, kind people! thank you. Un super sÃ©jour : le BB juste Ã cÃ´tÃ© du centre ville, un excellent petit dÃ©jeuner, une chambre impeccable, calme avec parking !